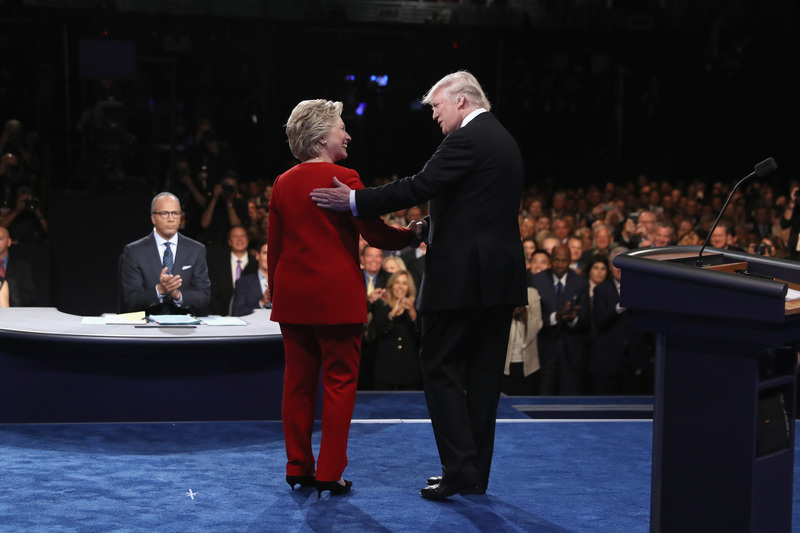 The first 2016 presidential debate kicked off Monday, Sept. 26 at the Hofstra University in Hempstead, New York and it's so important that moderator and NBC Nightly News anchor Lester Holt and the powers that be to fact-check everything. Because just minutes into the first debate of the season, there have already been some questionable statements. For instance, Democratic nominee Hillary Clinton opened the debate with a flat-out lie. Kind of. To be fair, Clinton was just being polite when she lied on stage in front of millions of viewers. But we all know what she was thinking when she said, "Donald, it's good to be with you tonight." Did anyone else catch that? She definitely started the night off right with that one and Holt didn't even call her on it. But really, is anyone ever actually happy to share a debate stage with GOP nominee Donald Trump? I see you, Clinton, I see you. Monday's first presidential debate got off to a heated start between the two candidates almost immediately. To begin, they started the conversation by discussing the economy, jobs, and NAFTA. Clinton also began by speaking about paid family leave and gender equity in the job market. There were quite a few lies that made their way across the stage on Monday night that were far worse than Clinton's innocent early acknowledgment of Trump. For instance, Clinton alleged that Trump equated climate change to a hoax made up by China. He, of course, denied the claim as he did with most claims using the word "wrong." However, according to Politifact, a previous Trump tweet read, "The concept of global warming was created by and for the Chinese in order to make U.S. manufacturing non-competitive." Trump also lied about his support for the Iraq War, again with the single response "wrong." However, a Sept. 2002 interview that the businessman did with radio and TV personality Howard Stern indicates the opposite. Politifact notes that when asked about his support for the war, Trump actually responded, "Yeah, I guess so." Trump also alleged during the debate that he had received an endorsement from the federal agency, Immigrations and Customs Enforcement (ICE) which is another big fat lie, according to NPR. Well, it seems the first debate went pretty much according to script, I suppose.